Vermeer extended its CTX mini skid-steer product line with the addition of the CTX100 compact utility loader. The CTX100 features vertical lift boom arms, which offer a higher lift capacity than a similarly sized radial lift arm machine, according to the manufacturer. In addition, Vermeer increased the hinge pin height to help landscape contractors load and transport materials more efficiently. The new CTX100 has a tipping capacity of 2,958 pounds and a rated operating capacity of 1,035 pounds. On 7-inch tracks, the CTX100 measures 36 inches wide and can fit through a standard gate. Additionally, the CTX100 is available with 9-inch-wide tracks. For additional accessibility, the CTX100 has a hinge pin height of 89.5 inches. The extra 7.5 inches of pin height can also help contractors lift materials over the side of a taller truck body. The CTX100 has a 40 hp Kohler KDI Tier 4 Final diesel engine for tackling tough job site applications. The Kohler KDI engine is equipped with an exhaust after-treatment system that uses a diesel oxidation catalyst (DOC), which requires less maintenance and eliminates the regeneration process that is necessary with a diesel particular filter (DPF) equipped system. It also has a universal mounting plate and comes standard with dual auxiliary hydraulic controls to support a variety of high- and low-flow attachments. Hydraulic flow ranges from 8.1 gallons per minute up to 15.5 gallons per minute, depending on the demand of the attachment. To help the operator monitor engine performance, the CTX100 is equipped with a new multifunctional display that provides machine readouts, such as operating hours, rpm, oil and hydraulic temperatures, and displays machine diagnostics and engine codes. 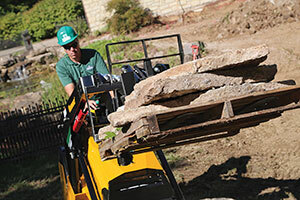 Like other models in the Vermeer compact utility loader lineup, the CTX100 features a chariot-style, ride-on platform. The enhanced operator’s station features a single, pilot-operated joystick for smoother operation. The spring-cushioned platform keeps operators out of the mud and debris and provides additional support when working in rough terrain. The operator presence system is integrated into the platform, in which the ground drive and attachment motion is suspended if the operator steps off the machine.